Pali Plumies Inc. is a informational site started by horticulturist Jeanette A. Summers. Jeanette's interest in creating this company and website was sparked by a recent visit the islands. The site was designed to share the spirit of Aloha and the beauty of tropical plants from the islands of Hawaii. The islands offer some of the most beautiful tropical plants in the world and our goal is to share the beautiful plumeria plants that we are experimenting with and growing here in Phoenix, Az , I feel that you will enjoy the information about tropical plants that I hope inspire you to grow some plumerias of your own in Phoenix and help you create your own little tropical paradise. Here at Pali Plumies Inc., we believe in supporting other gardeners in their desire to grow tropical plants. Currently we are propagating plumerias as a hobby and building up our collection of many varieties of these beautiful plants. We have had a successful season of growning named varieties from cuttings and grafted plants. Once are plumies have matured it is our hope to offer plants and cuttings for sale. We will strive to provide our clients with helpful information about growing high quality, tropical plants in the deserts of Arizona. 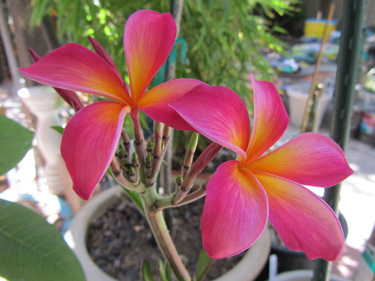 Our knowledge, reliability and services will make Growing plumerias in the Arizona desert easier to the average gardener that shares the love of these beautiful plants. You will learn about plumeria care including watering, fertilizing, planting, heat tolerance, and hardiness of these plants in our harsh desert environment. We hope you enjoy all the information we have provided you about these beautiful tropical plants. Please take the time to check out all our website has to offer including more information on the Island of Oahu. Please feel free to contactus for more information about the plumerias Your comments and suggestions are also welcomed. We hope you have enjoyed your visit to our website and we hope you return again, and as the locals say Aloha and Mahalo!